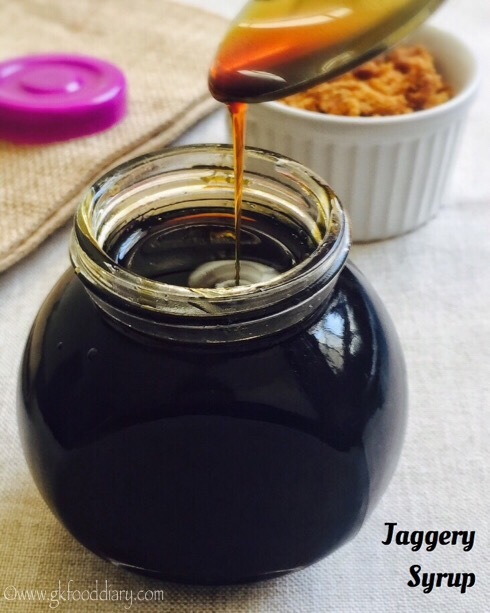 Jaggery Syrup – homemade, healthy sweetener for baby food, porridge’s and desserts. Jaggery is a made from the juice of sugar cane and its unrefined, also jaggery is rich in iron as its prepared using large iron vessels hence its an healthy compared to refined white sugar. 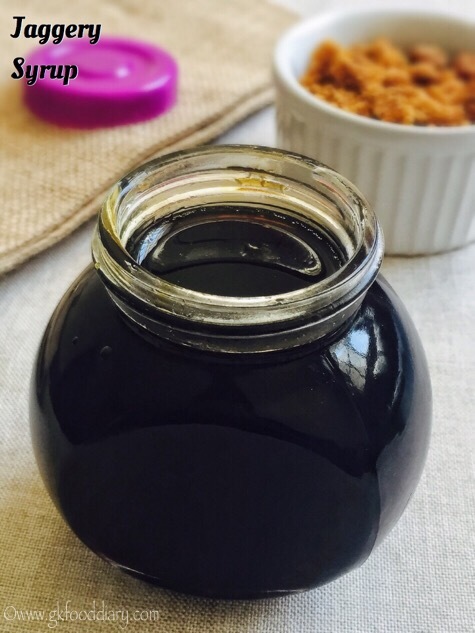 This jaggery syrup tastes so good and can be easily made at home, Its very handy when making desserts/porridge’s. This jaggery syrup can be stored in refrigerator and stays good for more than 3 months. But I recommend to make it as small batches and consume with in a month from preparation, in that way we could make sure that it stays fresh. 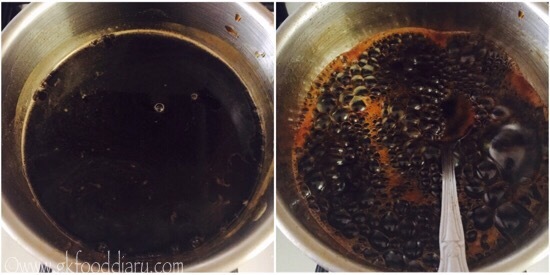 Do check out the dates syrup recipe which I have shared a while ago. When jaggery syrup can be introduced to babies? Jaggery syrup can be given to babies from 6 months after consulting with your baby’s pediatrician. As this syrup contains good amount of iron, it fulfills the iron requirement of baby at this stage and prevents anemia. But giving jaggery /jaggery syrup too often makes the baby sweet tooth. Hence its always recommended to use this jaggery syrup in moderation, you can use it once a week at the max. 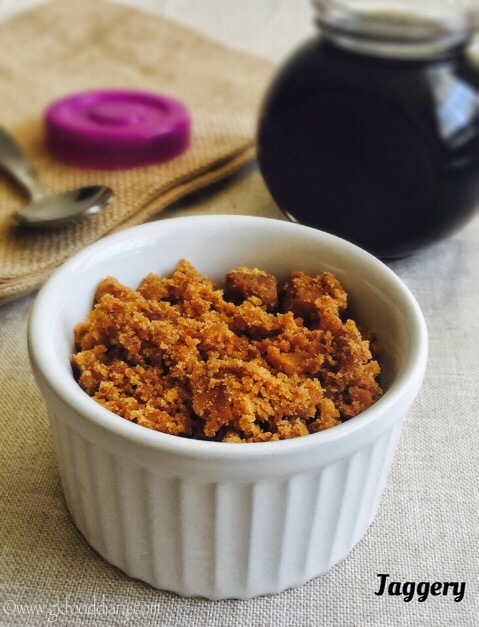 Jaggery is available in three forms: raw melted paste form, cubes and powdered. You can choose jaggery in any form for your food, but make sure its dark colored, organic and aged. Avoid the yellow color jaggery which is more chemically treated! 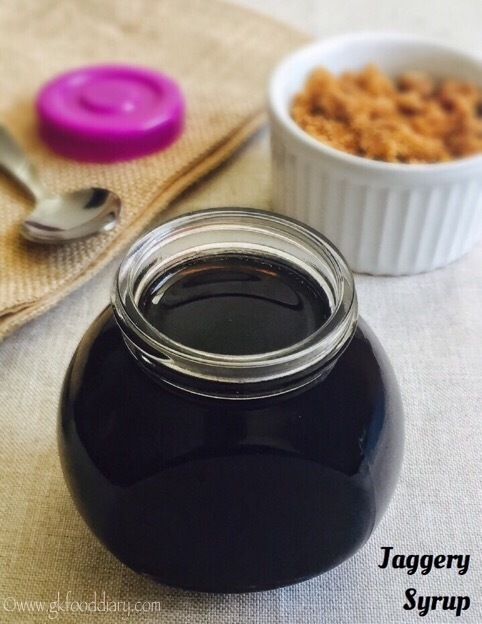 How to consume this jaggery syrup? add it to any breakfast cereal or milk poha. Use as a sweetener for desserts instead of sugar. Use as a spread for dosas, pancakes, Chapati/roti or bread. Combine with milk and offer your toddler/kid. 1.Measure the powdered jaggery using a measuring cup & keep it ready. 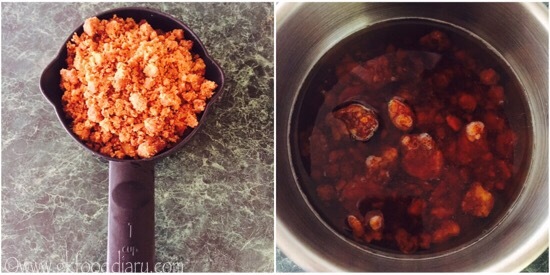 Take the jaggery in a saucepan and add 3/4 cup of water. Heat the jaggery for 3-5 minutes until it melts completely. 2. once the jaggery is melted, switch off the flame. 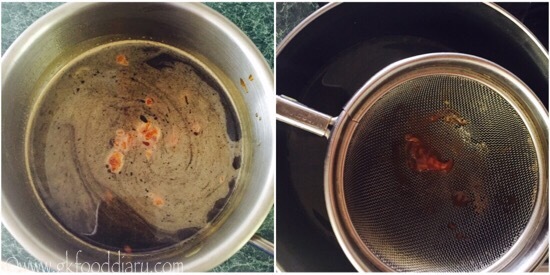 Now strain the jaggery water using a strainer in another vessel. 3. Then boil the jaggery water in a pan until its slightly sticky and lightly thick. Keep the flame low to medium and stir it occasionally to avoid burning at the bottom. Switch off the flame once done. It may take 3-5 minutes. The consistency is very important for storing the jaggery syrup, it shouldn’t be neither thick nor too runny. Healthy homemade jaggery syrup is ready! Strianing the jaggery water is important to remove impurities if any. Adding more water makes the syrup watery and it takes more time to reach the desired syrup consistency. The color of the jaggery syrup is depends on the type of jaggery variety used. This jaggery syrup becomes little thick after cooling down so switch it off the flame accordingly. Don’t over boil. The consistency is very important for storing the jaggery syrup, it shouldn’t be neither thick nor too runny. Keep it refrigerated and consume with in a month, use a clean dry spoon every-time while using.